Stoke Park's convenient location, just 35 minutes from London yet in the heart of beautiful English countryside, means that there is a wonderful array of things to do during your stay. From museums and theatres to theme parks and shopping centres, there is something to please everyone. Windsor Castle is the oldest and largest occupied castle in the world and the official residence of Her Majesty the Queen. Its rich history spans almost 1,000 years and the castle covers around 13 acres. Bicester Village is a collection of nice, chic outlet shopping villages. If you fancy a day of pure indulgence in the fashion world, this is the place to visit. With the likes of Armani, Prada, Versace, Gucci, Dior and Hugo Boss to name but a few of the boutique outlets on offer. The greatest names in theatre come to the Theatre Royal Windsor, as they have since it opened in 1910. This intimate theatre boasts Bill Kenwright as its producer and audiences are treated to new productions before they transfer to London's West End or go off on a tour of the country. There is also a traditional pantomime every Christmas. Stoke Park, Europe's leading 5 AA Red Star Country Club, Spa and Hotel, is set among 300 acres of glorious parkland, lakes, historic gardens and monuments created over the past one thousand years. 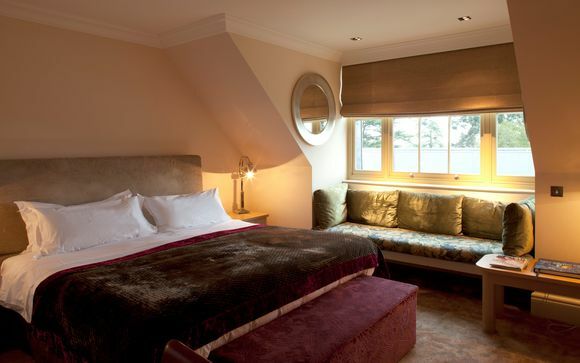 It boasts one of the most convenient locations in Britain: only 35 minutes from London and 7 miles from London Heathrow. They are a private estate and there is no public footpaths, or right of way access anywhere over the 300 acres, making this stay even more exclusive. Please note: Cancellations must be at least 48 hours before check-in. This offer is based on a complimentary upgrade from Superior to Deluxe Room. These rooms located in the Pavilion are contemporary in style and have easy access to the tennis and health facilities. These rooms have a king size bed as well as marble bathrooms. Each room comes fully equipped with mini-bar, tea and coffee facilities, adjustable mood lighting, air-conditioning, iPod docking, HD TV, marble bathrooms with heated floor and complimentary WiFi. This offer is based on a bed and breakfast stay. Just for you: 3 Course Dinner in the Orangery each night. Humphry's holds 3 AA Rosettes, thanks in no small part to the Head Chef Chris Wheeler's modern British food with a twist and exquisite signature dishes. Your dining experience here, surrounded as you are by stunning décor and panoramic views of the estate, will be a lasting one. San Marco provides a relaxed Italian brasserie experience with an array of classic dishes, extensive children's menus, smoothie specialties and alfresco dining in clement weather. Enjoy Afternoon Tea at Stoke Park in The Orangery with delicately hand-made sandwiches, cakes and scones served with delicious clotted cream, along with your choice of a wide range of teas and coffees. Please note: guests are kindly requested to call the hotel in order to confirm the timings for dinner: 01753717171. Just for you: complimentary use of the tennis and health facilities. Named one of the 'ten best spas in the UK' by Tatler, The Independent and The Daily Telegraph, Stoke Park Spa prides itself on offering luxury treatments which transcend you from your everyday hectic lifestyles into tranquil escapism. Includes: 11 treatment rooms, a beautiful private atrium with stunning five metre tropical aquarium, deep relaxation room, Italian Marble steam rooms and an indoor pool complete with built-in hydro-seat Jacuzzi. 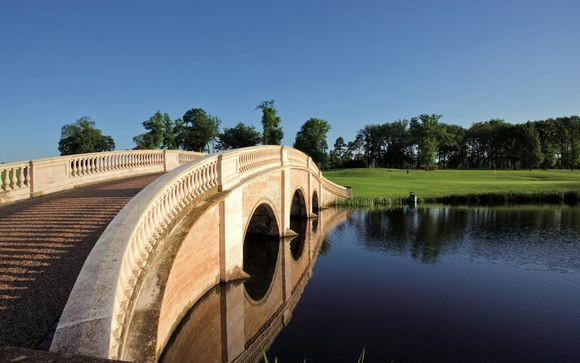 Encircling the club's 300 acre Buckinghamshire parkland estate, the famous 27 hole Championship golf course, is undisputedly one of the finest parkland courses in the country. 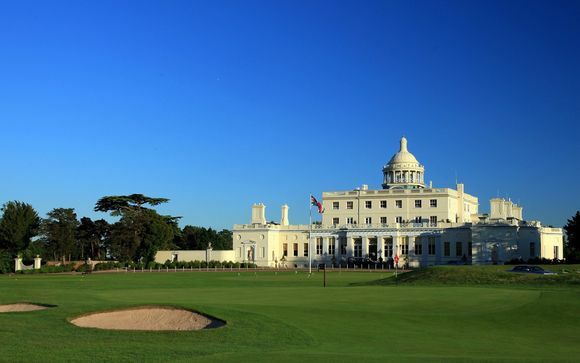 Created in 1908 by eminent golf architect Harry Colt, the Stoke Park course has been the inspiration for many of the world's most famous holes, including Augusta's infamous 16th. 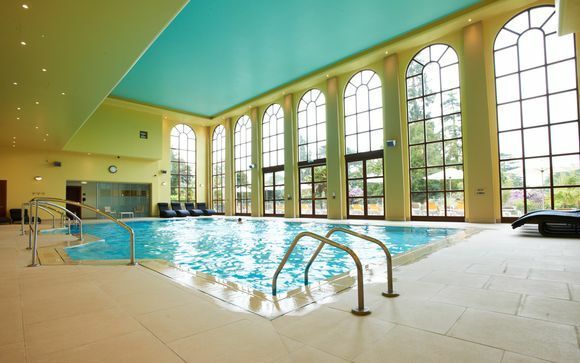 You will have complimentary use of the tennis and health facilities, which include an indoor swimming pool with hydro seats, newly equipped state-of-the-art gymnasium, multi-surface tennis courts (grass, floodlit artificial clay and indoor), steam room, fitness, spinning and hot yoga studios which host up to 40 classes a week.